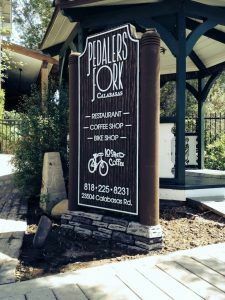 A couple of years back we made a brand new monument sign for Pedaler’s Fork in Calabasas, California using Peachtree City Foamcraft’s product. Pedaler’s Fork is a restaurant, bar, coffee shop, and bike shop all in one that wanted a completely customized outdoor sign. They wanted a rustic wood look so our first choice was to use Peachtree City Foamcraft. Due to where they wanted the sign, we decided to go with a V-shaped monument sign so it could be seen from both sides without being a typical double-sided flat sign. The entire sign is actually one piece with different components of it carved and painted to look like stone, wood, and posts. All of the lettering and the bike image is raised and painted. Foam is a lot easier to work with than actual stone and wood, and this high-density foam can actually be more durable than actual wood. Earlier this year, Peachtree City Foamcraft reached out to us for their 2017 monument sign design contest asking us to submit photos and details of signs we’ve made using their substrate. Out of the many submissions, the monument sign we made for Pedaler’s Fork won 3rd place! We’re very proud of how the sign came out and we’re very happy to see that the design is still being appreciated. Foam is completely customizable because anything can be carved into or out of it. Along with monument signs, we’ve also used foam for some storefront signs. They are also custom carved and painted, they were just installed on the facade of a building instead of on the ground. We have made signs that were completely carved, and some that are mostly foam but have dimensional letters put on there separately that were made from acrylic. The options are endless with foam because it so versatile while being durable so it is a great choice for custom outdoor signage. Although foam can’t be internally illuminated like other signs, we’ve had clients use other forms of illumination like uplights so their sign can be seen at nighttime. The same method can be used by installing lights onto your facade if you want a custom foam sign for your storefront but still want to advertise your business at night time. 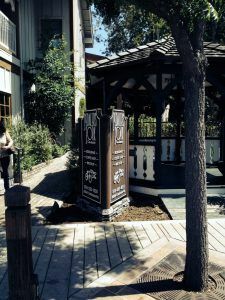 If you’re interested in getting a new monument sign or building signfor your business, feel free to look around our website galleries to get some design ideas.